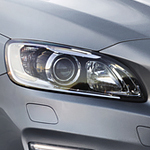 The Volvo S60 has a stunning interior, making it a popular luxury compact sedan. When you visit us at Star Motor Cars Volvo, we can show you all that it has to offer, including a spacious interior for passengers and cargo as well as plenty of technology to keep you connected. You will be able to comfortably seat five inside of the Volvo S60. The standard upholstery is leatherette, complete with power-adjustable front seats. You can also upgrade to leather with massaging front seats, heated front and rear seats, and more. The second-row seats fold flat, too, giving you plenty of room for cargo. The luxury sedan also offers a 9-inch infotainment touch screen, a premium audio system, and the ability to connect your smartphone. You can take a hands-free approach to making calls, listening to music, and getting navigation to your final destination.